Il centro della città di Mosca si sta rinnovando attraverso un grande progetto di riqualificazione urbana denominato “Moja Ulitsa” che significa “La mia via”. Lanciato nel 2014 dall’amministrazione comunale sta completando la realizzazione di 50 nuovi parchi, la risistemazione di 50 km di strade e piazza, 12 lungofiumi, e il restauro di moltissime facciate storiche, con progetti del Design Strelka e alcune star dell’architettura mondiale. Uno dei lungofiumi riqualificati dal programma "La mia via"
Una delle strade rinnovate dal programma "La mia via"
A questo programma di riqualificazione si stanno affiancando due altre operazioni, entrambe meno pubblicizzate. 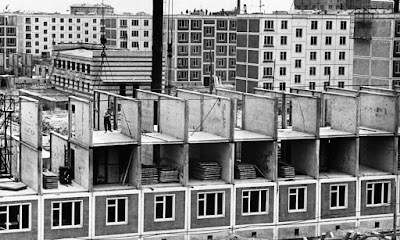 La prima, è un massiccio programma di demolizione delle case economiche del Soviet, le cosiddette "khrushchevka", tipici edifici per appartamenti a basso costo construiti negli anni Sessanta per fare fronte alla crisi abitativa. Questa decisione ha suscitato non poche proteste, ma anche consensi visto che, per legge, non si possono intraprendere demolizioni o ristrutturazioni senza il consenso dei 2/3 dei proprietari/residenti. Pur essendo realizzati con moduli standard prefabbricati, senza ascensori e con materiali economici e metrature minime, gli edifici da demolire sono generalmente situati in zone ben dotate di servizi e spazi pubblici. La maggior parte dei residenti, diventati poi proprietari, hanno vissuto a lungo in questi appartamenti e stabilito delle relazioni profonde con il quartiere. Il sistema prefabbricato di un edifico costruito nel 1961. All’approvazione della demolizione i residenti hanno 90 giorni di tempo per evacuare e trovarsi un altro alloggio. Sono circa un milione le persone coinvolte nel programma di demolizione dei palazzi sparsi in diverse zone della città. Con il sostegno del presidente Vladimir Putin, il sindaco di Mosca Sergei Sobyanin ha dichiarato il programma una "necessità assoluta" per poter sostituire le vecchie abitazioni. Mentre per molti abitanti questa è un operazione di pura speculazione, in cui i soldi hanno il sopravvento su qualsiasi altra cosa. I residenti sostengono che, pur non essendo perfetti e avendo bisogno di essere ristrutturati, sono solidi. Inoltre non solo rappresentano un pezzo di storia ma danno un senso di appartenenza a comunità di quartier consolidate nel tempo. Non vogliono trasferirsi in nuovi grattacieli costruiti in zone a loro estranee. Perchè nonostante le promesse dell’amministrazione sarà difficile che gli abitanti potranno rimanere in zona. L’amministrazione sostiene che i vecchi "khrushchevka" non sono ristrutturabili, ma analisti e attivisti sostengono che il programma è mosso soprattutto da una forte volontà politica di eliminare tutto quello che ricorda il Soviet e dagli interessi economici dalle lobby del mercato immobiliare, costruttori compresi. Gli articoli del Guardian, qui sotto ripresi, documentano questo processo. La seconda operazione riguarda la completa riqualificazione dei cortili residenziali. L'ufficio del sindaco sostiene che questi spazi, situati all’interno di grandi complessi, non dovrebbero essere dei passaggi pubblici aperti di collegamento, ma devono diventare degli spazi privati. MOSCOW'S BIG MOVE: IS THIS THE BIGGEST URBAN DEMOLITION PROJECT EVER? 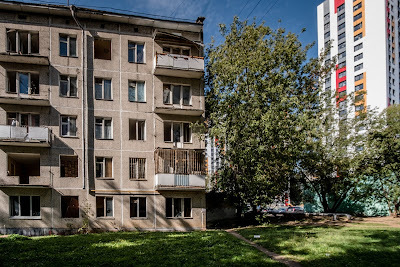 Now 16 Grimau Street, along with up to 7,900 other Soviet flat blocks in Moscow, are to be torn down, in what will be one of the largest urban resettlement programmes in history. 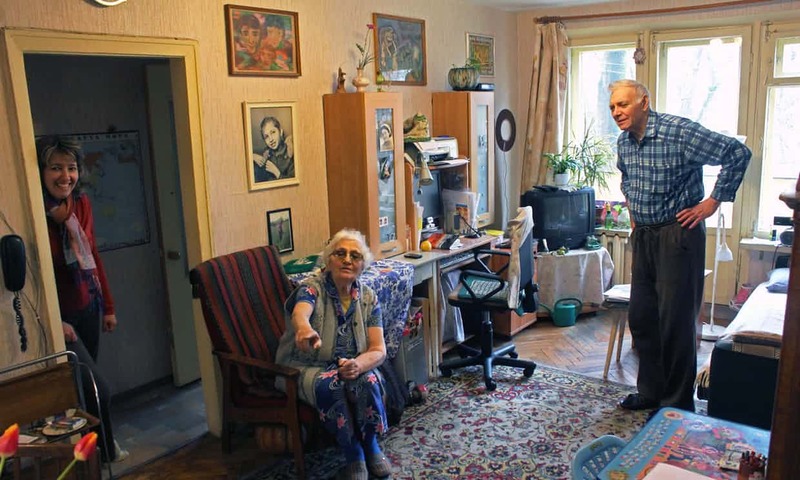 With the backing of the president, Vladimir Putin, Moscow mayor Sergei Sobyanin has declared the programme an “absolute necessity” to replace ageing housing. He promised the replacement flats would be 20% larger on average. il primo "krushchevka", costruito nel 1957. Many residents have joined him in speaking out, fearful that the government will build huge housing towers rather than comfortable neighbourhoods, and resettle people far away from their current addresses. 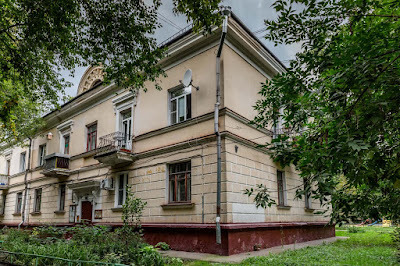 Many of the Khrushchevka buildings could be renovated, they say. Analysts have argued the demolition project is driven by politics and profits. Furthermore, the federal legislation to give the Moscow city government power to knock down entire neighbourhoods has worrying implications for the rights of residents and small-business owners. Residents who do not sign an agreement to transfer ownership of their flat within two months will be taken to court. “They are forcing people out, like under Stalin,” said activist Lena Bogushch. 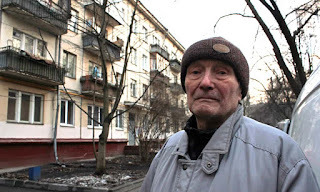 Opposition activist and former MP Dmitry Gudkov noted that the legislation would allow the government to tear down not just Soviet prefabricated flat blocks, but also nearby “analogous” buildings. When asked about how the fate of nearby buildings would be decided, the author of the law, MP Mikhail Degtyaryov, recently told TV Rain that a city commission would simply “take a neighbourhood and circle” the whole thing for demolition. “The law allows the programme to be realised not in the interests of residents, but in the interests of the construction lobby,” Gudkov said. 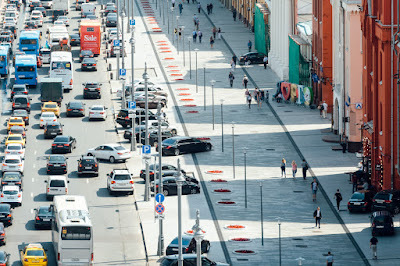 Since Sobyanin came to power in 2010, Moscow has tackled several huge urban development projects. 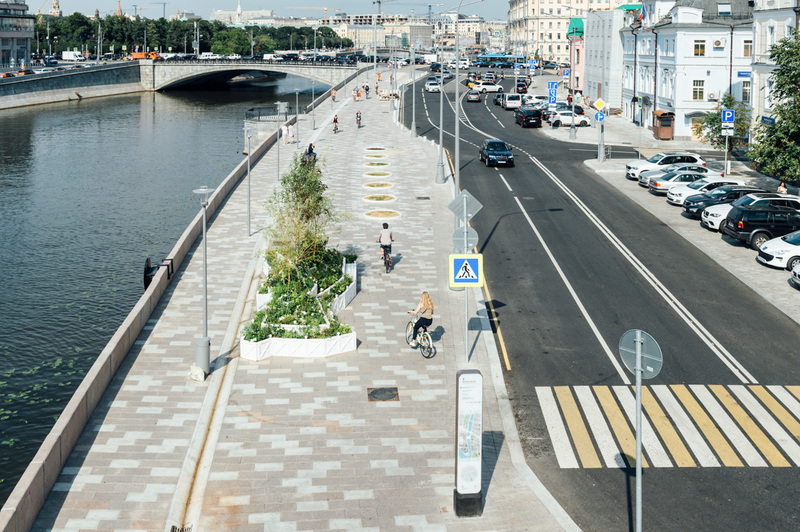 It has refurbished Gorky Park, opened the Moscow Ring Railroad, and started a 120bn-rouble (£1.4bn) renovation of one million sq metres of streets. It has encouraged the demolition and redevelopment of gigantic Soviet industrial areas. But the programme to renovate five-storey buildings, as the city euphemistically calls it, will be by far the largest undertaking yet. 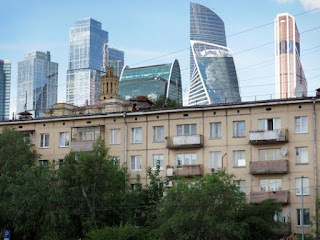 Although the city has yet to list the buildings that will be demolished, Sobyanin has promised that 25 million sq metres of residential real estate – more than 10% of the city’s housing stock – will be torn down. An estimated 1.6 million people will be resettled. The city says it will spend at least 300bn roubles, and independent experts have estimated the actual investment will be 3tn roubles. It’s not clear what kind of buildings will replace the Soviet housing. Moscow’s chief architect declined to comment, and the mayor’s office asked for written questions but failed to answer them. Il Soviet costruì circa 200 milioni di metri quadrati di appartamenti tra il 1933 e il 1970. Ubiquitous throughout the former USSR, Khrushchevka buildings stand as testaments to a sea-change in Soviet policy and culture. Under Joseph Stalin, “Stalinist empire” architecture glorified the USSR with grandiose forms, and most new housing projects were individually designed, ornamental, spacious brick buildings reserved for the Soviet elite. The majority of the population lived in rickety barracks and crowded communal flats, sharing toilets and kitchens and bathing in public steam baths. After Khrushchev came to power, he declared that the architecture of the past 20 years had been full of expensive excesses that were “causing significant harm to the economy and hindering the improvement of residential and cultural and social conditions for the working classes”. Instead, the state should develop unembellished, prefabricated housing that could be erected cheaply and quickly, with the goal of giving every family its own flat. Thus began a three-decade housing drive that was unprecedented in human history. It ushered in a new, industrial approach to construction: several different designs for prefabricated flat blocks were tried out in the Cheryomushki neighbourhood, where Rudakov lives, as was a residential district layout – minimising through-traffic and maximising green space – that would be repeated throughout the country. Working mostly with concrete panels and other factory-produced components, brigades of labourers competed to see who could put together the huge flat blocks the fastest. One team managed it in 11 days. 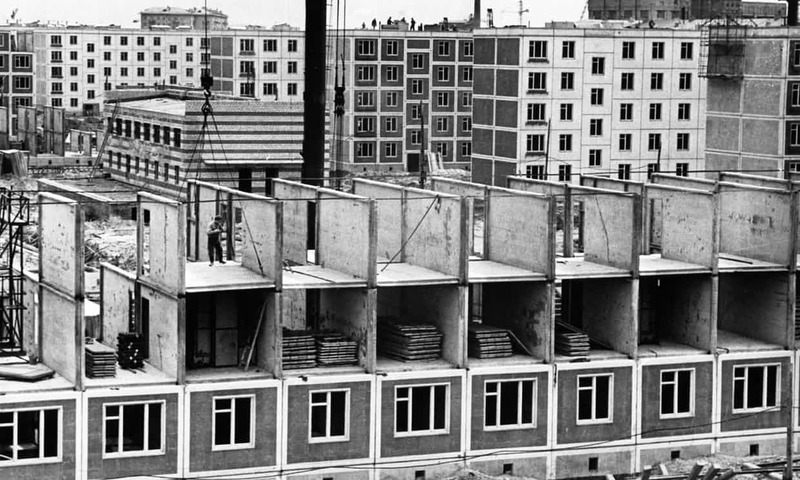 According to the Russian state statistics service, the amount of housing built by the state jumped from 26.9 million sq metres during the second five-year plan (1933-37), to 152.2 million sq metres in 1956-60 and 227.6 million sq metres in 1966-1970. Between 1955 and 1964, a quarter of the Soviet population, or 54 million people, received their own flats. By 1975, the state had built 1.3bn sq metres of housing, and it continued to build in huge amounts up until the Soviet breakup. For the first time, large numbers of people had private housing in the city. This huge resettlement marked a boost in quality of life, a change in living habits, and a cultural shift that was commemorated in works including Dmitry Shostakovich’s operetta Cheryomushki, named after the neighbourhood where the first Khrushchev flats were built. “Look the hallway is ours, look the coat rack is ours! The whole flat is ours, ours! The kitchen too is ours, ours!” sang the main characters in a 1962 film based on the operetta. According to Olga Kazakova, an art history PhD student and director of the Institute of Modernism, one theory is that along with Khrushchev’s de-Stalinisation policies, the privacy allowed by Khrushchevka flats contributed to the rise of dissident activity, such as samizdat (the copying and passing of banned literature by hand), in the 1960s. In addition, the new housing was fairly low-density, and its common areas and green space facilitated socialising among neighbours, according to Nikolai Yerofeyev, a philosophy student at Oxford who is writing his dissertation on postwar Soviet housing. He also owns a flat in a Khrushchevka that will probably be torn down. Of course, such mass-produced housing had drawbacks. The height of functionalism, Khrushchevka were architecturally monotonous: rectangular, five-storey boxes with evenly spaced windows, balconies and staircases. The ceilings were low and single-room flats were typically only 30-33 sq metres, while two rooms were 33-45 sq metres. Lifts and trash chutes were shunned as a costly extravagance. There were complaints about sound isolation and heating in the wintertime. Some included strange innovations, such as a small niche beneath the kitchen window, separated from the outside by only a few centimetres, meant to function as a refrigerator in the cold months. The five-storey buildings were designed to last about 25 years. Most have served longer, with mixed results. 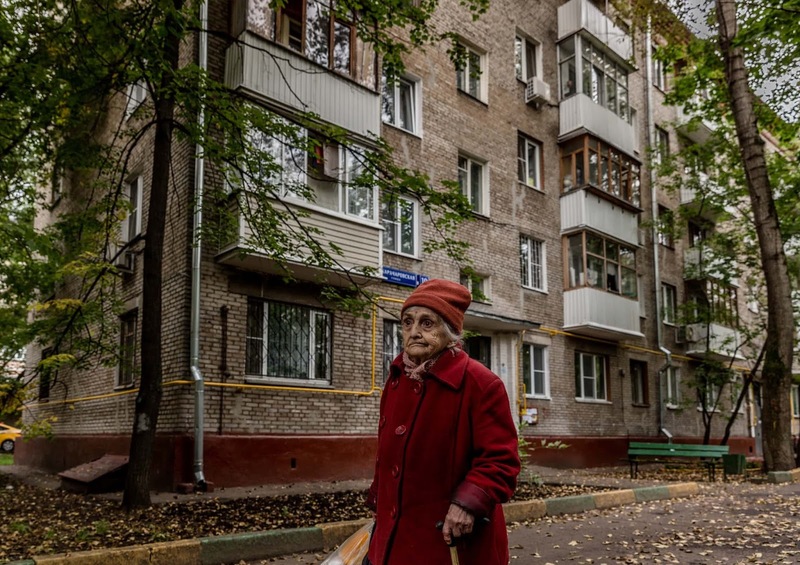 Retired dentist Sofa Shkolnik, who lives with her husband, Felix, in a five-storey flat block built in 1962, said she is warm in the winter and can barely hear the neighbours. The building, which is surrounded by green space with apple, cherry and pear trees and several playgrounds, is on a tentative list of blocks to be torn down. Shkolnik fears they will be resettled to a high-rise building or moved far away from their daughter, granddaughter and great granddaughter, who all live nearby (the city has promised to resettle residents within their districts, but some of these cover large, incongruous areas). “I love modest housing – a small building, close to the earth, so I can look out the window and see trees and people,” she said, sipping tea on a stool at the tiny kitchen table, a pot of borscht on the stove next to her. Since the water pipes were recently replaced, she added, their building “could serve for a while more”. But Felix said the sewage drainage system had not been replaced and had burst a pipe twice in the past decade. “We’re on a state of alert in case it breaks in another place, because the utilities are old,” he said, adding that he had recently drilled into the concrete panel wall to find it was disintegrating. Sobyanin argued that the five-storey buildings are too difficult to renovate, since the pipes for plumbing and central steam heating are built into the wall. “Even if we do some sort of renovations in these buildings, in 10 to 20 years they will nonetheless turn into hazardous housing,” he told Komsomolskaya Pravda newspaper. The quality and condition of five-storey buildings varies widely. While many were built with concrete, others were built with bricks, which are typically sturdier and more heat-efficient. The most dilapidated Khrushchevka buildings in Moscow have already been torn down, according to Yerofeyev. He called the programme an attack on “low population density, [which] apparently is too big a luxury in Moscow now”. n one notable example, Stefan Forster architects in Leinefelde, Germany, knocked down the top floors of eight Soviet flat blocks from the 1970s, stripped them down to their concrete structure and outfitted them with new windows and balconies and ground-floor gardens as part of an urban regeneration project. Forster said renovation costs depend largely on how much is rebuilt to modern construction standards, such as better sound isolation requirements. “In principle, prefab flat blocks are suitable for conversion to affordable housing,” he said. But Moscow is reportedly not up to the difficulty and cost of such a task. Earlier this month, the respected business newspaper Vedomosti quoted an unnamed official as saying the city had decided that building new housing would be cheaper than renovating. According to official statistics, half of the residential buildings in Moscow are in need of major structural repairs, and only a few dozen have been redone. Another reason may be political, as Sobyanin and Putin are both likely to run for reelection in 2018. Political analyst Dmitry Orlov estimated that as long as residents aren’t moved too far away and small business owners are fairly compensated, the new programme could boost electoral support in Moscow by 15% for the mayor and 7% for the president. He based this on how a smaller resettlement programme under previous mayor Yury Luzhkov had “changed public opinion (and) allowed him to preserve a high level of trust over the years”, he said. Activists’ main complaint is that the programme is mostly about money, and both developers and the city stand to make a handy profit. They point to a recent example of a partially completed programme started in 1999 to replace 1,722 five-storey buildings. For that scheme, the city contracted private developers, who built new tower blocks, set aside 30% of the apartments to resettle residents of the old buildings, and sold the rest. Vedomosti quoted a source in the mayor’s office as saying the new programme will free up a large number of land plots that will be sold to investors at auction. The devil will be in the detail, and specifically in what kind of housing is built and where; new residential towers in Moscow are often as tall as 25 storeys, leading to less personable neighbourhoods and more traffic congestion. Already, Moscow traffic jams are among the worst in the world. Housing density will almost certainly increase, given that that five-storey buildings now occupy 8,000-10,000 sq metres per hectare, while city norms allow for up to 25,000 sq metres per hectare. “They haven’t told us what technologies will be used in the new buildings, how they will look, and the quality of modern construction in Russia is not that high,” Kazakova said. According to Maxim Trudolyubov, editor-at-large of Vedomosti, the programme’s results will depend largely on whether private firms or a state construction company build the new housing. 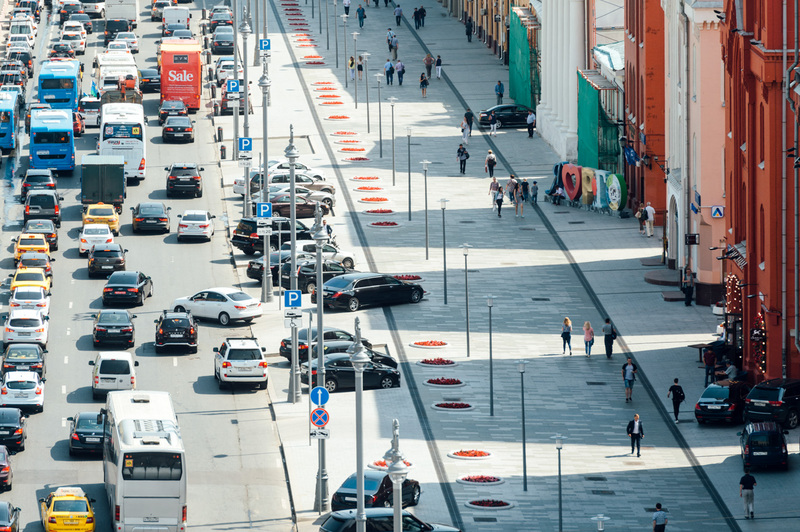 “Private companies will need to sharply increase the amount of square metres that exist in Moscow, “which will choke the city for good with torrents of people and transport,” he wrote in a recent column. Yulia Fedosova and her son, Maxim, live in a typical five-storey concrete-panel apartment block. Known as a Khrushchevka, after the Soviet leader who orchestrated the industrialisation of house-building, Nikita Khrushchev, it first appeared in 1956 in an experimental housing estate in south-west Moscow that was quickly heralded as the solution to the postwar housing crisis. 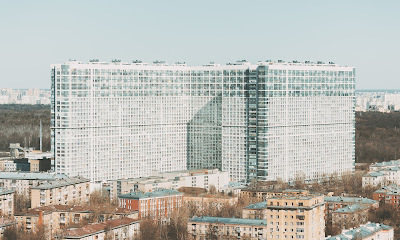 Factories were built, workers retrained, and by the mid-60s this modest, prefabricated style of apartment block had sprung up like clusters of mushrooms everywhere from Minsk to Vladivostok. The Fedosovas’ estate is well-connected to the city centre. Essential services – kindergarten, schools, a health centre, transport links – are easily accessible on foot, and their flat looks down on to apple trees, flowers and a children’s play park. It is tranquil, the air is fresh and the development is planned at a human scale. Both Fedosova and her father grew up there; several generations of her family live in nearby flats. Under the June law, if two-thirds of residents in a block vote yes to the so-called “renovation programme”, the block will be demolished. Fedosova voted no: for her, the demolitions won’t just destroy buildings, but also a sense of history, home and belonging. 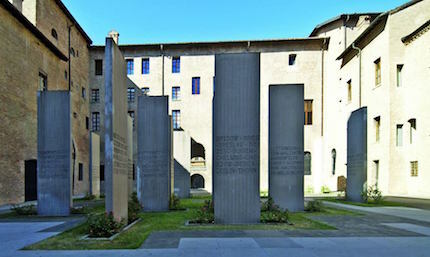 Enough yes votes were cast, however, to slate the building for demolition. Once she receives the official notice, Fedosova will be required to leave her home in 90 days, or face forced eviction. She will be given no option of where to live, likely moved to a newly built tower block. The authorities have promised that residents will be rehoused in the same district, but many fear their longstanding networks of families and friends won’t survive the move. Above all, Fedosova fears being exiled in “New Moscow”, the hastily erected towers on the city’s periphery, many of which remain unsold. .
To counteract the rumours that the renovation programme is really all about profiting from real estate the mayor of Moscow, Sergey Sobyanin, is working overtime to persuade residents that there is no alternative to demolition. His team are busily constructing show flats kitted out with state-of-the-art furnishings. Sobyanin insists that the Khrushchevka flats are beyond redemption: the kitchens are too small, there are no lifts or waste disposal system and the roofs often leak. Yet many residents maintain nothing is wrong with their flats that standard repairs couldn’t fix. Anastasia Yanchikova is one of numerous residents left exasperated and confused by these explanations. “I feel safe here. I can see my children in the yard,” she says. “We leave our bikes at the bottom the stairs. I have a right to stay in my neighbourhood. I want to choose myself where to live, in what kind of building, place and so on. Tatjana Goreleva, a lawyer, and her husband say they have invested more than 1m rubles in their apartment, in a five-storey block of robust brick in the Nishegorodsky district. Like Yanchikova’s, her house was also scheduled for major repairs in 2016 that were never carried out. Her anger mixes with suspicion. There are undoubtedly problems with some of the older flats; the build quality is variable. Some architects and engineers argue, however, that the faults can be remedied without prohibitive expense. Professors at the prestigious Moscow Academy of Architecture such as Yuri Pavlovich Volchok and architect Evgeny Asse have said that with intelligent design many of the blocks can be given a new lease of life; structural engineer Sofia Pechorskaya notes that the planning process, which she calls “technically illiterate”, has been carried out without proper research and professional consultation. Vladimir Komarov, a retired government worker, lives in a veritable theatre set of Russian history. His flat is lined with antique green wallpaper, the floors are original hardwood, and he is surrounded by family portraits and clocks made by his horologist grandfather. Three generations have lived here; his grandmother is buried in the cemetery next door. 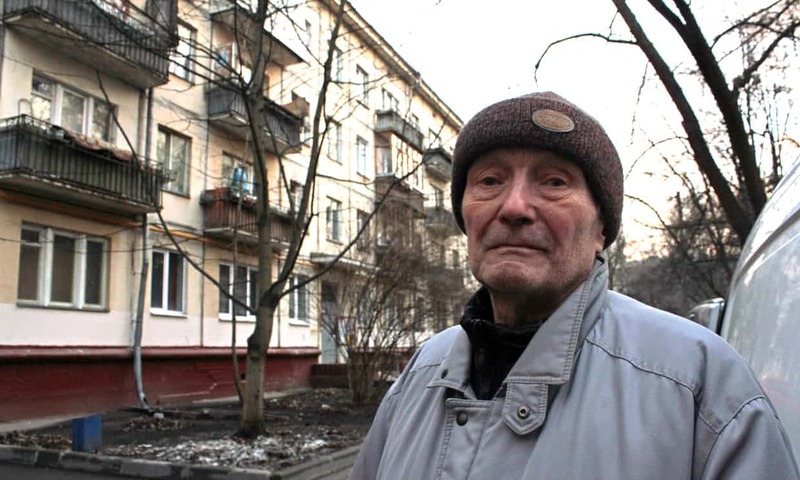 When he received his eviction notice, Komarov had a stroke that put him in hospital for two months. He says he has been loyal to the state all his life, and feels betrayed. His friend, Vera Voronina, boasts a brand new bathroom, kitchen and living room in her apartment. Over a six-year period, she and her husband saved everything they could and renovated the flat themselves. Though it is nearly complete, the majority of residents in her block voted for demolition, so they will be thrown out. The residents of their building say their neighbourhood has its own special ecology: it boasts a district heating system and is well served by hospitals, clinics, schools, shops and transport links. Speculation swirls that this is why their apartments face the wrecking ball while other blocks that, they say, are more clearly in need of repairs but more isolated, are left standing. One of the consequences of the privatisation of the Russian housing sector was that homeowners became responsible for the upkeep and maintenance of their properties. For many people on low incomes who couldn’t afford to invest in repairs and renovations, this became an impossible burden. Vast numbers have voted for demolition having been lured by the prospect of a new apartment. Not surprisingly, the vote has caused considerable friction between friends and neighbours on opposing sides of the debate. For the Leskovas, the vote has meant the breakup of the social foundations on which people have built their lives. The peace and harmony of their block has disintegrated. Arguments and shouting matches have broken out. The atmosphere has become hostile. The required meeting of all the residents to decide on the fate of their block never happened; instead, people voted individually and in secret. One person who has seen both sides of the story is Tatyana Buyanova, an architect and town planner who lives a 10-minute walk away from the Leskovas with her son. Her picturesque two-storey cottage sits on prime land. A former employee of one of the development companies, Buyanova was involved in the selection of potential sites for new housing in the earmarked “renovation zones”. Buyanova began to suspect that the urban restructuring programme was more about real estate speculation than any social commitment to improving people’s lives. Some journalists, lawyers and engineers say that building codes – including for light, height and proximity of buildings – are being relaxed, and construction permits expedited. When her own home – which she maintains was in good condition – was included on the demolition list Buyanova resigned and joined the protest movement. Pavel Novikov, an engineer, lives in the former industrial district of Metrogorodok. His flat is not included in the programme, which he suspects is because the building site is too narrow to be of interest to developers. The blocks either side are coming down. A member of the Muscovites Against Demolition protest group, he is typical of the activists who are resisting the demolitions. Most are ordinary folk: pensioners, single parents, newcomers to political action. Notably, a majority are women. Certainly the sense of illegal dispossession is palpable, and in the early days of the protests banners were emblazoned with the word “deportation”. Nikolai Kanchov, who ran in the recent municipal elections for the Yabloko opposition party, argues that the forced evictions violate the Russian constitution, which guarantees the right to private property. It made Stein a minor celebrity, and at just 21 years old she has just been elected as an independent deputy for the Moscow municipal government. Photographer Vivian del Rio can stare down, from her current flat, on the partially demolished neighbourhood where she once lived. She still remembers the chaos of moving out: people were still packing their bags as the wrecking crews moved in. Reluctantly, she has accepted a new flat in multi-storey tower. A kilometre down the road house lies a neighbourhood that will be completely razed. According to the Moscow Development Department’s interactive map, which shows all the properties scheduled for demolition, 80 apartment blocks will be removed in just this one locale. The website also shows the locations of the new replacement tower blocks – and the large area of land that will then become available for sale. Tellingly, it is close to the city centre, and only two stops from fashionable Gorky Park and the Tretyakov gallery. The land will be sold into the private sector; several luxury towers featuring penthouse flats have been built; there is speculation that other plots may be handed directly to banks by struggling construction companies to repay loans. After the 90-day eviction period, the timing of the demolition itself is not made public, but the process can be rapid: whole blocks have disappeared in a day. In the Butirsky district of north Moscow, you can see the rubble of recently demolished five-storey buildings. 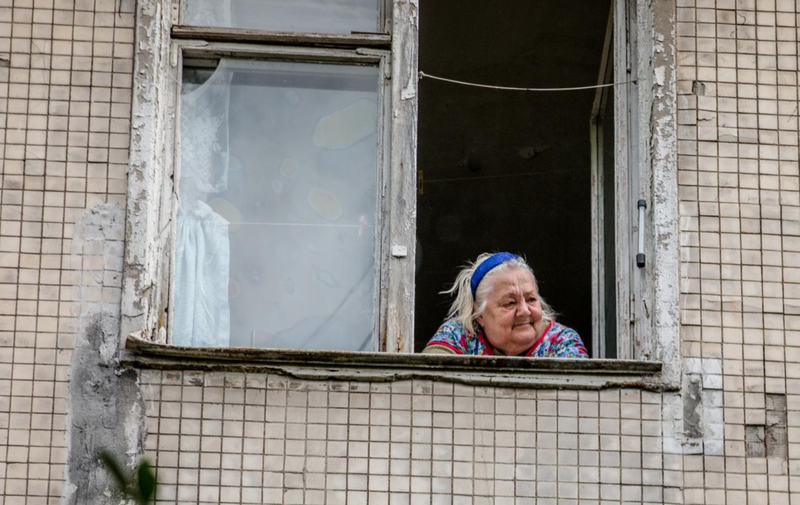 From the top floor of one partially evacuated block, an old lady looked out with a smile. The flats either side of hers are already empty, but she doesn’t look in any hurry to move. In Krilatskoye, in the north-west of the city, furniture is flying out of the frameless windows. In the empty flats, children’s drawings hang from the wallpaper and family photographs lie on the floor. Clothes, shoes and a ceramic print of someone’s grandmother sit in a pile. People have left in a hurry. Chris Leslie is a documentary photographer and film-maker. Dr Jonathan Charley is a writer and teacher at the department of architecture of the University of Strathclyde. You can read more about their Disappearing Moscow project here.